Last month when I started telling you about My Favorite Ingredients , I mentioned the cherry chapter in the book and how I was looking forward to the start of the season. Well, it is upon us, and I now believe there is no quantity of cherries in my refrigerator that would be too much. Pickled cherries is the first recipe in that chapter, and I’d been thinking about them for weeks. I imagined vinegary, sweet, little bites of fruit with hints of spice served alongside a soft cheese with some personality. 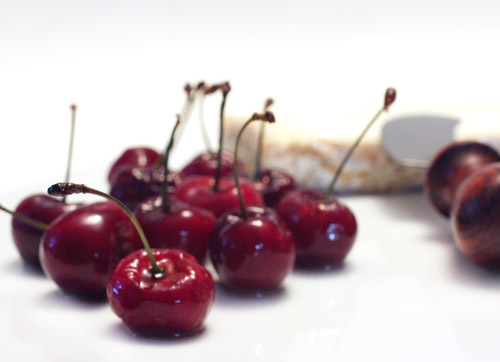 Also, there would have to be some bread and maybe a really good beer to accompany the cherries and cheese. 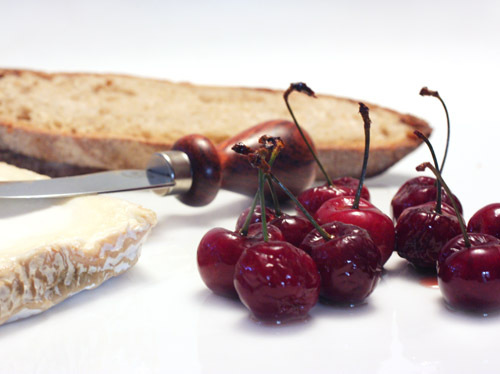 As soon as I found cherries in town, I set about pickling them, let them sit all of one week as I couldn’t wait another day, I baked some bread, visited my favorite local cheese shop, and the plan became a reality. I chose Leonora cheese from Spain which is a soft-ripened, aged goat cheese, and I grabbed a bottle of Saison Dupont otherwise known as my new favorite, summer beer. It all came together as a snack that makes the word snack seem inadequate. To pickle the cherries, they were washed and left with pits and stems intact. Sugar was dissolved in red wine vinegar and bay leaves, cloves, and peppercorns were added. The mixture was brought to a boil, simmered for ten minutes, and allowed to cool. The cooled syrup was poured over the cherries, and I stored them in the refrigerator. The longer they sit, and they can remain refrigerated for up to one year, the more wrinkly the cherries will become. Since I couldn’t wait longer than a week, mine were still mostly plump. In the book, pickled cherries are used in a warm pheasant salad with tardivo and toasted hazelnuts. That sounds like a wonderful fall dish, but I don’t think I’ll have any cherries left by then. Maybe I can come up with something more summery for a salad with notes of bitterness for balance. Something with arugula could work or possibly grilled romaine. While I think about that, I’m ready to make the cherry cordial and the brandied cherries from the book, and then I might have to pickle some more before the season ends. wow!!!! Awesome clicks. feel like eatin cherries now. Sounds delicious and amazing. I'm sucking on a cherry pit right now, and I think I might have to make a run to the store. alright i have been thinking about them since your tweet. i think with tandoori style shrimp and on arugula. I have to make these this season! They look amazing. Oh Lisa, this pickle cherry sound so good. I never even seen or heard anyone make pickle cherry before. yum--these are next on my list. thanks (and let me know when the drunken, i mean brandied ones are ready!). Hey, you beat me to it! Aren't these pickled cherries the best? I've been busy these past few days trying to come up with different ways to use them. So far nothing beats pickled cherries and assorted cheeses, though. They go so, so well together. We're thinking of making something with rainier cherries, but it would've just been a pie. You always come up with something way out of the box! This is totally new to me. I haven't seen or heard of pickled cherries before but now I am intrigued to try this. I usually make them into a spoon sweet which is perfect for desserts. Something new to me too. I would love to try the recipe..well, if I have any left! I can't wait to get my hands on some cherries too! This sounds great! Pickled cherries have me groaning with happiness. I love pickling weird crazy random things. They add such a nice WOW factor to any meal. Pickled cherries is such a terrific idea! Yum! They sound wonderful! I still haven't quite got the hang of proper canning so refrigerator pickling these cherries would be just right for me. As usual, you are my number one source for learning about recipe resources. I'll have to check out My Favorite Ingredients! I've never heard of pickled cherries, but I imagine they must be a bit chutney-like. I think u are so right to pair it with cheese. Looks like I've found my summer accompaniment for cheese and parties. Great post. We make pickled cherries at the restaurant where I work and it's great to see people doing them at home also. Your photographs are beautiful. I will definitely keep checking out your blog, it's really good! That final picture makes me swoon! Cherries rarely make it to the cooking stage at my house, but this inspires me!!! I will be on the lookout for a big bag of organic cherries at WF. Thanx! i can think of no less than 23 things to do with pickled cherries, and that's right off the top of my head. what a terrific idea. Do you have quantities for the ingredients. It looks really good. I am always looking for sides for my cured meats and this would me really good. MY relatives came to this country on a prison ship after being kicked out of England for rustling horses, and we will pickle anything. Watermelon rinds is a personal favorite of mine. But now I will have to try cherries. Thanks for the write up! My family has several generations of pickling experience and we look forward to pickling everything so that we can enjoy the versatility of the summer bounty now and through the winter season. Lisa, I'd love to hear how your brandied cherries turnout. This recipe rocks! I am 48 years ago, and am myself pickled. I think they sound awesome. Fabulous idea, Lisa! And cherries are sheer heaven right now. Can't wait to try this. I bet these are divine. They remind of a little of these grilled cherries I once had with a duck dish at a restaurant. They were tossed in sherry vinegar before being grilled. They were so amazing. I could have eaten an entire bowl of them. This sounds great. I never you could pickle cherries. Can't wait to try this. I am trying to wrap my mind around these wonderful flavors! I am hitting the market in a few, so I have some other pickling to do, and will try this! 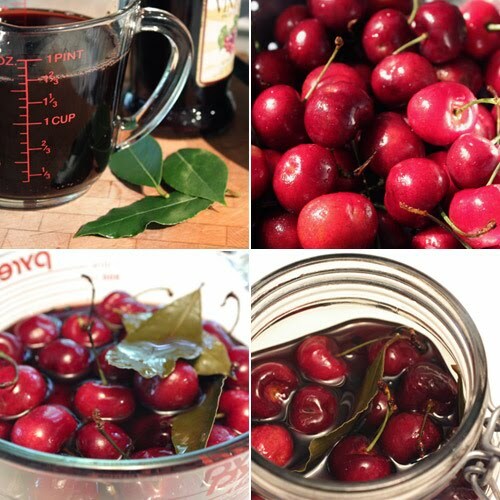 I've never had pickled cherries, I'm curious about this recipe....it sounds so great. interesting ingredient choice for a pickle!!! also very well presented. This sounds amazing! such a wonderful and flavorful way to preserve them.